As a wedding celebrant, I am very aware of how important each piece of the puzzle is in making your day perfect and the Wedding Breakfast is a huge part of this. When you have a room full of your best friends and family you want to be able to offer them great tasting food that also compliments your wedding theme. With so much to plan, it is really important to a bridal couple that they find a caterer that not only offers great food but is organized and reliable as well. The popularity of using a Wedding Celebrant means that many ceremonies are happening in some rather unique places and so you need a caterer who is confident that they can cope with all eventualities. 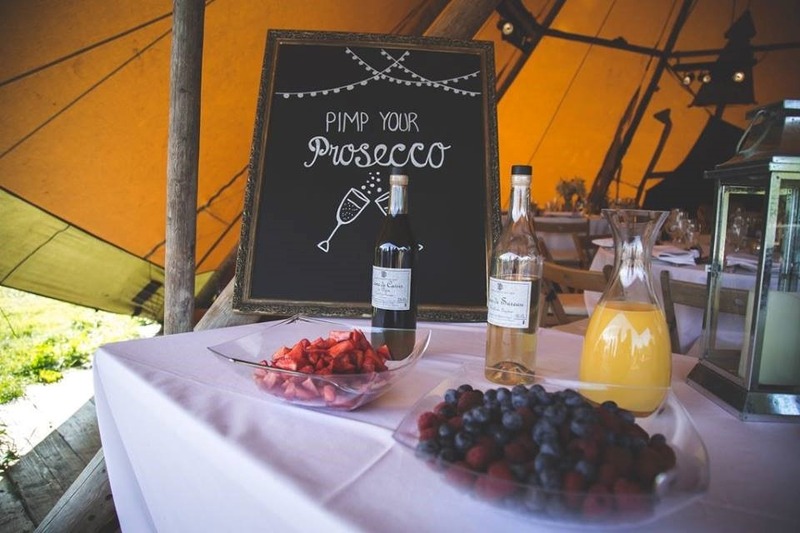 Sophie and Chris’s choice of venue enabled their guests to camp for the whole weekend. They went with the brilliant choice of Pieminister. pieminister.co.uk I asked them how they chose their caterers and why they went with them. Sophie told me that the thought of catering for 100 people in a field with only a single tap of running water was extremely worrying. They wanted to choose a caterer who could do something simple but do it very well, rather than choosing something fancy but average in quality. 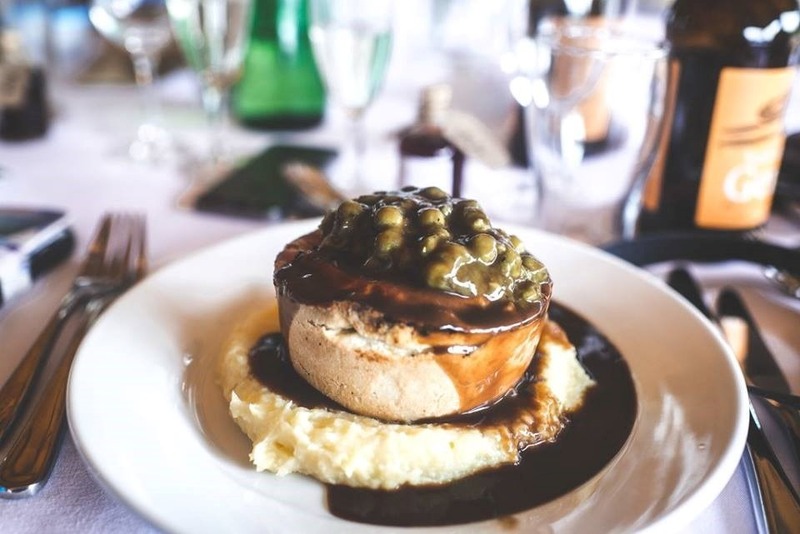 Having seen and eaten Pieminister pies at Glastonbury Festival, many times, Sophie knew that for them, doing their wedding would be a walk in the park and that the food would be fun, filling and memorable as well as being a good foundation for a long night of partying ahead. Pieminister also offered amazing dairy free, vegan, wheat free, child and vegetarian options, so everyone would be catered for. At their first meeting with the Pieminister team, a spreadsheet was created with timings and the order of the day. Following this a Wedding pack arrived in the post with what to expect on the day. Pieminister were in frequent contact, accessible and amazing to work with, which was a huge relief for Sophie and Chris who were planning their wedding themselves. Pieminister also helped to source the tablecloths and water jugs for the tables; nothing was too much trouble. On the Wedding Day, the guys from Pieminister were absolutely brilliant, capable, efficient, friendly and professional. Despite Sophie turning up 45 minutes late – well it is the bride’s prerogative!! – Pieminister simply altered their schedule slightly to ensure they caught up on the timings and everything was cooked to perfection. They made, what must have been quite an operation, appear completely effortless. It all went smoothly and to plan. And they certainly went the extra mile, staying much longer than they needed to, helping us to cut and arrange the cheesecake after Sophie and Chris made the first cut. 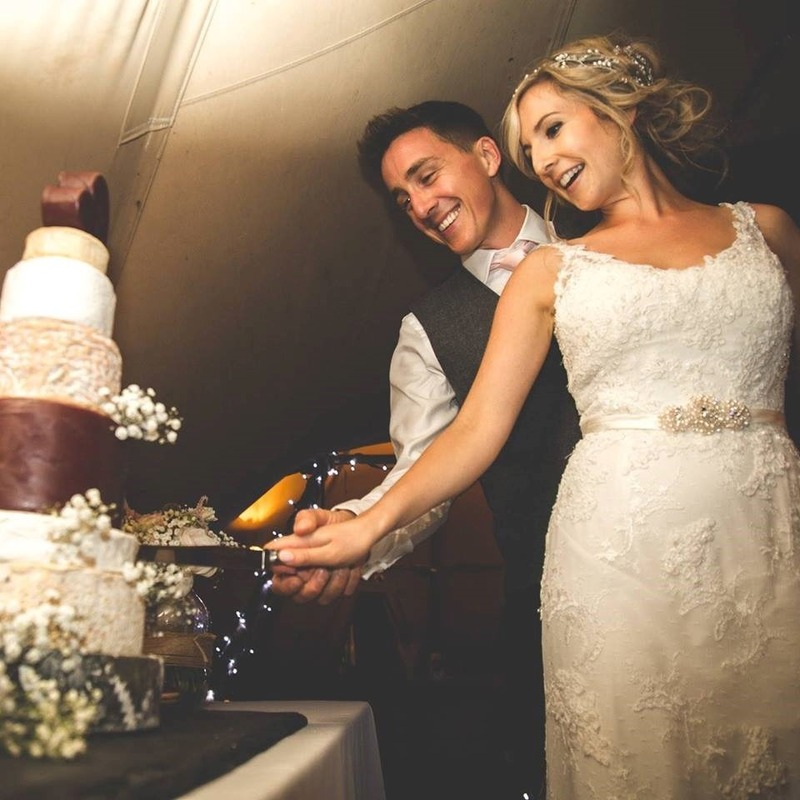 Sophie and Chris didn’t want a traditional wedding cake, opting instead for a Wedding cheesecake from godminster.com. 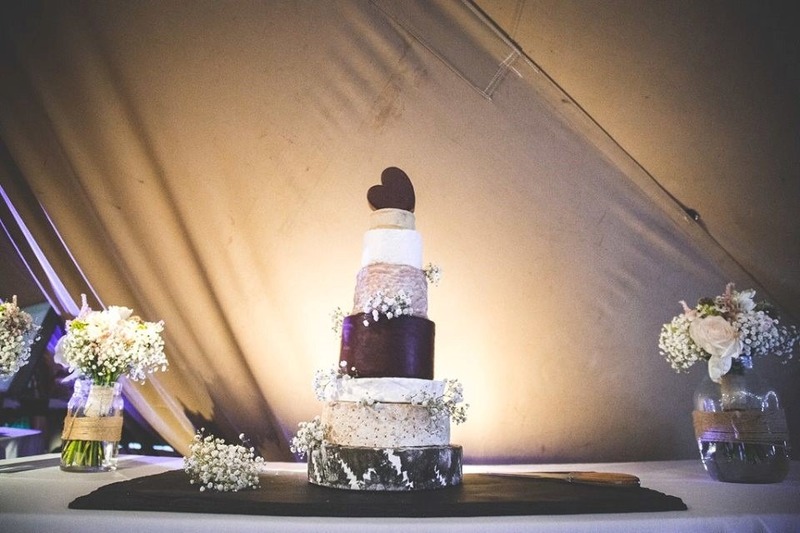 I felt a little put out as I LOVE wedding cake, however, when I sat down to eat, I noticed that Sophie had place a present on my plate – she’d given me my own wedding cake, so, I had the best of both worlds. The cheesecake was a great success. Each layer can be decorated with flowers or personalized to match your wedding colours and theme. We placed Gypsophila between the layers as we built it up, and again, the guys from Pieminister helped us unpack and stack it. The natural choice for the evening was a hog roast, from Paul Cornelius at the Somerset Hog Roast. somersethogroast.com. It was served in rolls with a choice of stuffing and – of course – applesauce, by two friendly chefs. The food was very tasty and flavoursome and there was plenty of it! Paul did a great job, he provided everything including the cutlery, napkins and plates and it all just magically appeared and really added to the ambience of the evening. I want to mention Sophie’s great friend Michaela who ensured that the guests woke up the following morning to the welcoming aroma of freshly fried bacon rolls and cups of coffee and tea. Breakfast certainly went down a treat Thank you Michaela!! The choice of caterers really helped to create the relaxed festival atmosphere that was so important to Sophie and Chris for their Wedding Ceremony. Sophie and Chris ensured that the caterers not only served the style and quality of food they wanted but were professional and reliable and had the ability to just turn up and do a good job. They were all excellent. As a celebrant, I will perform your ceremony in the venue of your choice. You may have a place that is special to you, or need help in deciding and choosing. WhiIst my focus will be on creating the perfect ceremony for the bridal couple and their guests, I am more than happy to offer my experience, advice and guidance across all the different elements, of your special day, including, of course the all-important food and drink!! In next week’s post, I will share with you Sophie’s choice of flowers and decorations and look at the important part they played in shaping and creating her and Chris’s unique and wonderful wedding weekend.